Welcome to the beautiful So. Cal High Desert. 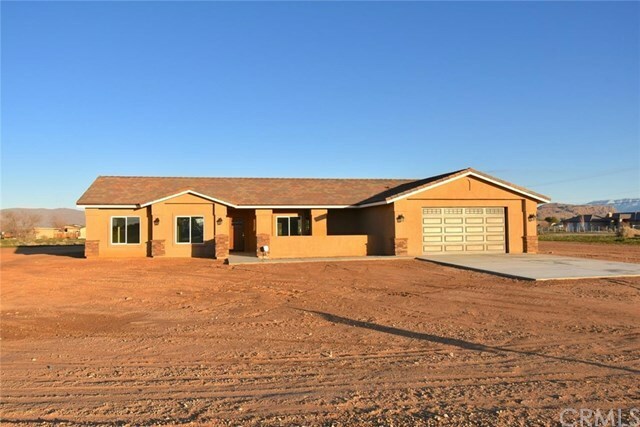 Brand new BEAUTIFUL home on approx 5 acres in a lovely area of Apple Valley. Front courtyard gives this home the ultimate curb appeal. Upon entry you are greeted with an open, modern great room w/ tile plank flooring & gorgeous stone veneer fireplace. Chef's kitchen w/ beautiful granite counter tops, oversized island bar w/ farmhouse sink & custom lighting, stainless steel appliances, custom stainless steel hood & self closing drawers are just some of the features! Bright & spacious eating area just off the kitchen as well. Split floorplan w/ 2 master suites! The first is well appointed w/ backyard access & designer style carpet! Oversized master bath with double sink vanity, big walk in closet, step in glass shower and luxurious tub. Two nice size guest bedrooms with ceiling fans & mirrored wardrobe closet doors! Second master is spacious featuring a private bath, walk in closet and backyard access! House-length covered back patio lets you enjoy those gorgeous mountain/desert views! Roomy laundry room w/ sink and storage, custom upgraded interior doors, energy efficient windows, tankless water heater, oversized finished garage w/ sink, 2 x 6 construction, security system and MUCH MORE! Be sure to check out the virtual tour! Directions: 15 Freeway UP the Cajon Pass to Hwy 18 exit - go East to Navajo - go North on Navajo to Thunderbird (2nd stop sign) go East - piq on left hand side.